I always imagined that the opening entry on my food blog would be an epic account of something deliciously complicated to make like macarons or sfogliatelle. I’ve since come to realise, however, that good food doesn’t have to be difficult to make. Good food can be wholesome, simple and full of wonderful memories. 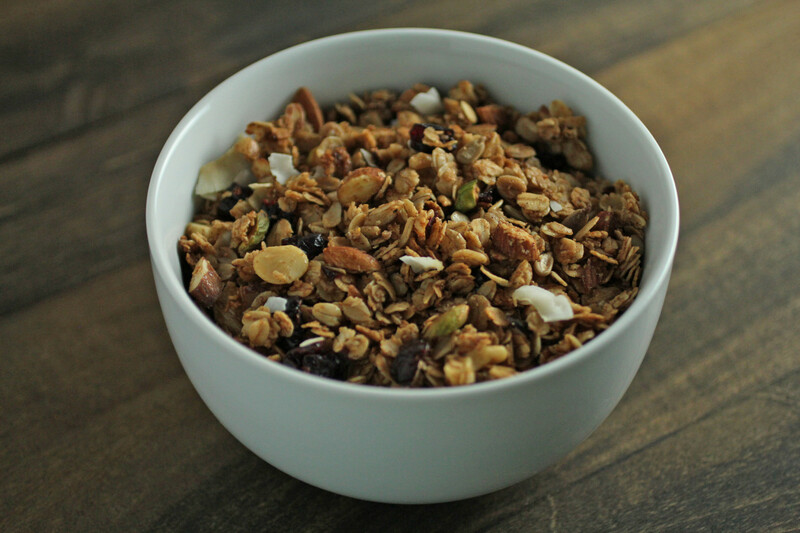 My sister used to make such amazing granola that I was convinced she had an elaborate recipe with special ingredients that made those crunchy morsels so addictive and delicious. My mother and I would nibble on it, much to the irritation of my sister who would wake for breakfast only to find a barren granola container, void of any fruits or nuts. She soon learned to cook two batches – one for breakfast and another sacrificial batch for my mother and me. Asking my sister for the recipe one day, I was surprised to find that the ingredients were so simple. She couldn’t remember the recipe exactly, but she did specifically say that the only spice she used was cinnamon. I was skeptical about the results I would achieve with such a simple recipe but the end result did not disappoint. 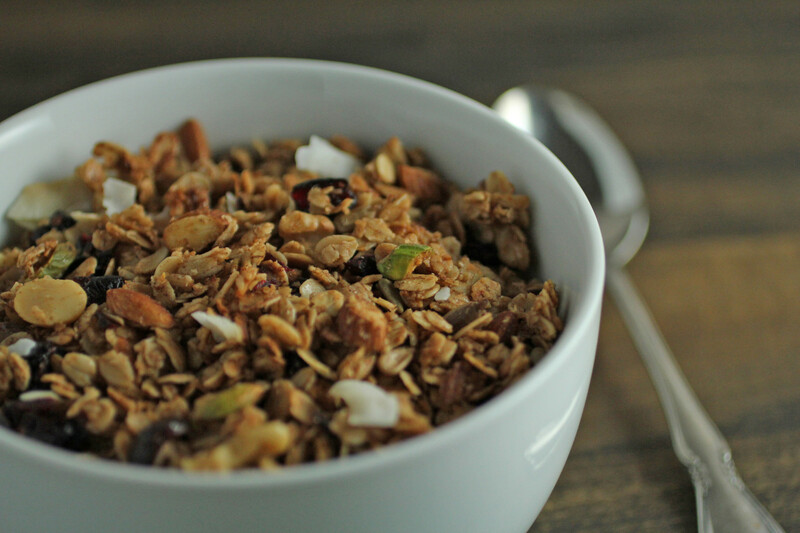 Here’s my twist on granola. Simply delicious. Line two baking trays with baking parchment, or silicone baking mats if you want to get fancy. Measure out the almonds, macadamias, pistachios, pecans and walnuts onto a cutting board. Coarsely chop the nuts. In a large bowl, combine the chopped nuts with the rolled oats, sunflower seeds, cinnamon and salt. Stir well to make sure everything is covered in cinnamon goodness. In a small bowl, whisk together the honey, oil and vanilla extract until combined. Drizzle the honey mixture over the dry ingredients and mix well until all the nuts and oats have been coated. If you are brave, you can mix this with clean hands! Pour mixture onto the lined baking trays. Spread and press down mixture with the back of a wooden spoon to about 1/2″ in thickness or less. Place trays into the oven and bake for 10 minutes. Remove trays from oven and stir the mixture. Spread and press down mixture with the back of a wooden spoon again. Return trays to the oven and bake for a further 10 minutes. Remove trays from oven and stir the mixture, adding the dried cranberries and shredded coconut. Return to the oven for another 5 minutes. Remove the trays from the oven and let the mixture cool on the trays. The mixture will crispen and stick together as it cools. 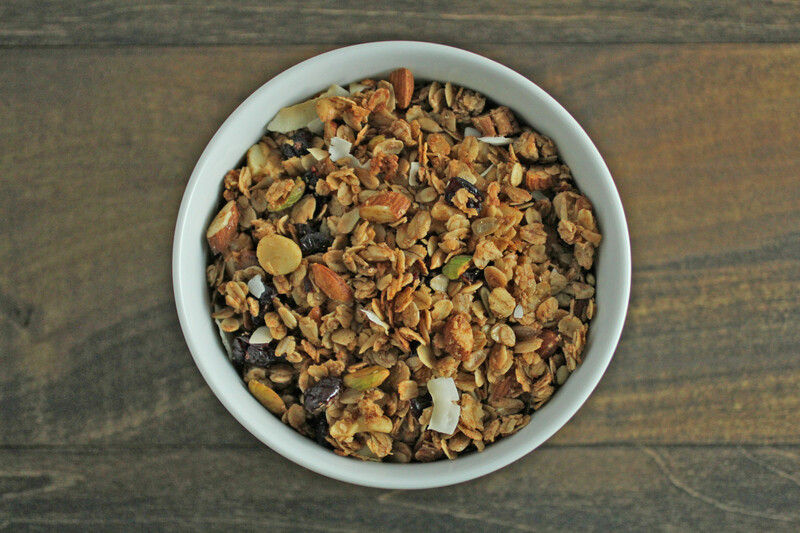 Store the granola in an airtight container at room temperature for up to a week. Enjoy as a breakfast cereal, yoghurt topping or on its own. For a more complex flavour, substitute half of the honey for maple syrup instead. If you are on a low sodium diet, you can skip the salt. If you’d like granola clusters, press the mixture together after the trays have been removed from the oven before it cools.